Reruns are still shown on MeTV, late Sunday nights. They are as funny as ever. For those not in the know, Idlewild is now JFK Airport. Kruschev was the Soviet premeir. 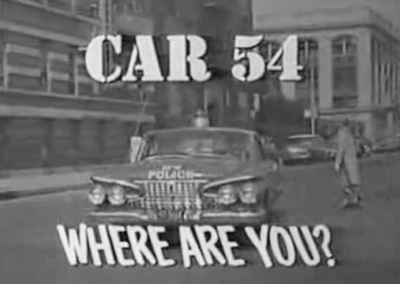 Today's trivia: The police cars on this show were painted red to appear blue. 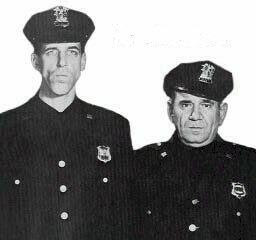 Toody and Muldoon and fellow officers of the 53rd Precinct? One of my favorite 'comedy relief' copshows, the other being Barney Miller! It was one of those fun shows that you just had to love.I've been around since 1947.That duck and cover that was taught in schools wouldn't had done us any good.It would had turned out like the movie "On The Beach"we would had all died. Wingslinger...I'm referring to the generations born after, let's say, 1967??? They'd have NO REASON to remember either Khrushchev, Idlewild OR Car 54...prolly B&W TV either....What I find deliciously ironic is that the son of the guy who pounded his shoe on the table at the UN in now an American citizen...Sergei Nikitavich Khrushchev is not only an American citizen, but a prrofessor at an American college!!! So much for the boast "We will BURY you!!!" So many of the younger generation AND/OR THEIR PARENTS no longer care about the past!!! I remember the days of the home built 'Fallout Shelters' which some referred to as "Khrusch Proof Boxes"
OOH! OOH! I remember Khrushchev and Idlewild! I think my all time favorite episode was Toody and the Art World. Being from NJ, I found the running joke hysterical every time he would give his interpretation of a particular abstract painting as "lower Manhattan at sunset......from the Jersey side". That always cracks me up. There's a Scout troop short a child, Khruschev's due at Idlewild,..
Of course, nobody bothered to explain how one pair of NYC policemen might be expected to patrol all those areas.